Accidents can happen unexpectedly, even when you take precautions to prevent eye injury. The eye is a very delicate organ. Be prepared and reduce the risk of permanent damage by treating injuries correctly and promptly. Seek professional medical help as soon as possible. Visit the Child Life section for advice on supporting a distressed child. Don’t panic. Stay clam, and help to keep your child calm – your child will follow your lead. Don’t delay medical attention. Seemingly minor eye injuries can quickly worsen, causing serious, possibly irreversible loss of vision. Don’t rub the eye. This is a natural response, but the pressure can worsen an injury. Keep your child’s hands away from her face. Avoid aspirin. This medication thins the blood and can worsen bleeding in the eye. Don’t use ointments or drops without seeking medical advice. The containers may not be sterile, risking infection. They may also reduce the doctor’s ability to thoroughly examine the eye. Encourage your child to blink repeatedly to help remove the debris. If this does not work, gently pull the upper lid down onto the lower lid, and ask your child to blink several times. The lower eyelashes may sweep the debris away from the upper eyelid. If this too does not work, keep the eye closed and seek medical help. A “black eye” is caused by bleeding under the skin around the eye. The bruising will initially appaer purple-blue and fade over several days. Although most black-eye injuries are minor, extensive bruising can be a sign of serious injury, including a fractured skull. Bleeding within the eye is also serious, and may potentially damage vision permanently. As soon as possible after the injury, apply a cold pack to the eye area for about 15 minutes. This will help to reduce swelling and bruising. A bag of ice or frozen vegetables, wrapped in a cloth will do. Use gentle pressure, but do not press directly on the eye. Seek immediate medical care if your child has blurred or double vision, bleeding in the white or coloured part of the eye (iris) or from the nose, or uncontrolled pain. Always seek immediate medical care. If possible, take the bottle containing the chemical to the hospital as this will help the doctors provide appropriate care. While you are waiting for emergency help, do not bandage the eye or use any other covering. Gently open the eyelids as wide as possible with your fingers. Flush the eye with clean water for at least fifteen minutes. Encourage your child to roll the eye around as much as possible as this will help to thoroughly wash it. Seek immediate medical care. Don’t rinse the eye, apply pressure or try to remove any foreign objects. This may cause further injury. Protect the eye from pressure by taping a shield over the bones surrounding it. If you do not have an eye shield, use a household object like a paper plate or the bottom of a foam cup. 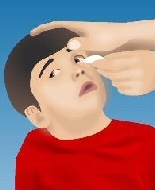 If nothing is available, cup your clean hands over the injured eye until you reach specialist medical care.